Having addressed the importance of accident reporting during superyacht regattas in a recent SuperyachtNews article, we spoke to the SuperYacht Racing Association (SYRA)'s Kate Branagh about the association’s ethos regarding the issue. In order to enhance the safe racing culture and encourage the sharing of such information, Branagh explains that SYRA issues a safe racing declaration form at every event to enhance safe racing. The form, which is given to each participating sailing yacht and is required to be fully completed and handed in by the afterguard team after every day of racing, asks for details on approximate wind speed and direction for each leg, details of any penalties taken, any safety related incidents, equipment breakage and sustained injuries. It is emphasised that the information will be kept in confidence and will only be used by SYRA in the evaluation of potential trends and problem areas. Branagh adds that examples of common injuries that get reported are caused by whipping lines and fingers caught in hatches, but that all captains and crew know of these potential dangers well. Nevertheless, SYRA is active in sharing information on how things should be done and the right procedures amongst the racing fleet. In terms of safety related incidents, details of any incidents that the yacht was involved in, or that the afterguard members observed, is required. This includes incidents where the 40m minimum separation rule was disobeyed and incidents of yachts not responding on the VHF safety channel. Competitors may also request a ‘safe racing hearing’, which is an informal hearing before the protest committee and organising authority for the purpose of rules clarification. In order to encourage such proceedings, it is not deemed a protest and no decision will be rendered that impacts a yacht’s standing in the event. “Without raising a flag, the yachts can have a safe race expert analyse and clarify the rules regarding a certain incident,” says Branagh. SYRA recognises that reporting near misses is also very important for improving the overall safety culture of a regatta and shouldn’t be dismissed. Branagh adds that this includes incidents that occur not on the race course, recalling one incident where two yachts nearly collided before the start of a race. 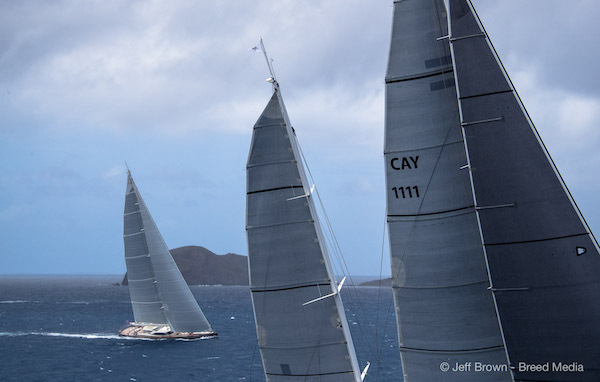 Considering that it was safety concerns and a very serious injury during a superyacht regatta that led to preliminary discussions and the initial SYRA meeting in 2010, safe racing is a constant priority for the association. With the support of captains and race crew, these simple but effective declaration forms contribute towards increasing the awareness and understanding of safety issues during superyacht racing.